Dr. Jim Winship has presented at our annual Salvation Army Social Service Conference for a number of years. His presentations are always sought after by staff and participants often schedule what workshops to attend only after selecting his workshops. We are always assured his content is informative and pertinent to our topics. His delivery is such that participants remain engaged and often list him as their first request for the next conference. Dr. Jim Winship designs and presents staff development / training experiences in a variety of formats, including two hour workshops, half-day, and full day training experiences. He has experience in Instructional Design and online educational instruction, and develops learning experiences with measurable outcomes. Early in his professional career, he designed and delivered training for four years at the Office of Continuing Social Work Education at the University of Georgia. Over his professional career, he has developed training materials and presented workshops for organizations that include The Salvation Army, Atlanta Task Force on the Homelessness, and the State of Wisconsin Bureau of Housing on topics that include effective case management, culturally competent social work practice, working with immigrant families, and working with homeless families. ​Jim is currently serving as a content developer and consultant with the Central Territory of The Salvation Army Social Services in the design and implementation of the Caseworker Certification Program. . In 2017, he conducted workshops for The Salvation Army Social Services in Chicago, Illinois and for the Northwoods Division (upper Minnesota and North Dakota) of the Central Territory. He conducted webinars for The Salvation Army Social Services in Wisconsin and Upper Michigan Division in 2017 and 2018. 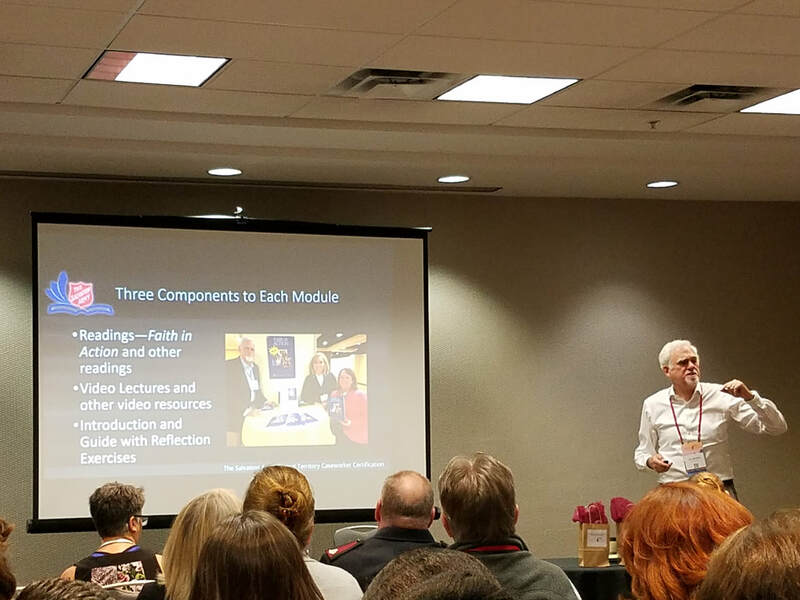 Jim presented the workshop "Promoting Change and Generating Support Through Clients' Digital Stories" at The Salvation Army National Social Services Conference in Kansas City in April, 2019. In 2018, he presented at four professional conferences on the use of story for advocacy and community awareness purposes, at the Poverty Matters Conference in Milwaukee, WI, at regional and Wisconsin Salvation Army Social Services conferences, and at the annual conference of the Northlands Storytelling Network. For over a decade, he has led three-day workshops in which individuals learn to develop their own digital stories, personal two to four-minute personal stories. They are meaningful to the person creating them, and can also be used for public awareness and organization communication. Examples of digital stories can be found in this site's blog. Jim has developed five short locative (location-based) digital stories featured on the StriveOn mobile app in the Whitewater Locative Digital Storytelling Project. Used to engage people and communities, locative stories and the StriveOn app adds context to places and localities. A description of the project and one of the digital stories can be found in Storying the Human Experience blog on this site, titled: "If Only These Walls Could Talk; Well, They Can." In August 2017, through Frontier Health, Inc. in East Tennessee, he conducted a three-day digital storytelling workshop with a group of women in recovery from drug addiction and alcoholism, assisting each of them in developing her own story as a part of the rehabilitative process. One of the participants wrote in her evaluation of the story she created: "I hope to one day be a voice for domestic violence for women. This is amazing." Dr. Winship brought to life the value and joy in remembering and sharing our family stories! The two family programs I serve at St. Joan of Arc in Nashotah, WI and St. Catherine of Alexandria in Oconomowoc, WI deeply enjoyed Dr. Winship's ease and captivating presentation. The telling of his own family stories encouraged all to look deeper into their own. The exercises he gave the groups were the favorites of the year! Jim Winship was a featured speaker on Wisconsin Humanities Council Speaker's Bureau for a number of years. He has spoken to a range of community and church groups. His presentation style incorporates both animated storytelling -- his own stories, stories of those he has worked with, and traditional stories -- and the perspectives that he has acquired through a wide range of life experiences: as a parent, a social worker, a college professor in the United States, a Fulbright Scholar in Colombia and El Salvador, and as an elected official. As a professional storyteller, he has performed in libraries, schools, and bookstores, as well as at storytelling conferences in the Upper Midwest and professional conferences. In January, 2018, Jim presented an hour-long story program on El Salvador and migration for the Conversation Cafe at Stage Left Cafe in Woodstock, Illinois.